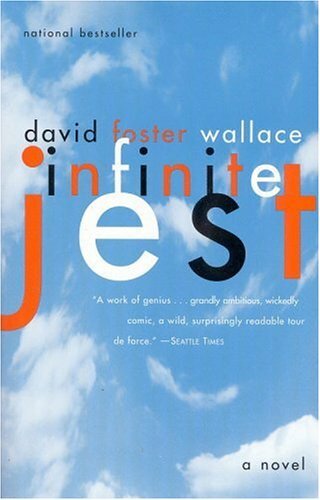 One of the items on my bucket list is to read Infinite Jest by David FosterWallace in its entirety, including the footnotes. I have tried and failed this feat twice, both times in high school, and I’ve kept this gargantuan novel of 1000+ pages on a prominent bookshelf. Every time I see the cover, I sense it’s mocking me. I am now on attempt #3 to read this novel. I am an adult, and not just any adult, but one who teaches writing to adults at a collegiate level. Because of that, I believe myself to be smarter and more capable of reading a dense, difficult novel than I was at 16. I may prove myself wrong. Also, I downloaded it as a Kindle e-book to, yes, make it easier to hold in my hands, but mostly to make it easier to read the footnotes. In previous attempts, flipping back and forth between the main text and end notes interrupted my reading flow. But with the e-book, all I have to do is tap the end note link to read the footnotes, and then tap again to go back to the main text exactly where I left off. Also with an e-book, all I have to do is tap a word I don't know and get a dictionary definition. I have come across at least 8 words I don't know - two of which weren't listed in a dictionary. My goal is to read at least 10 pages per day, which means it will take me about two and a half months to complete. I am now on page 75 and am remembering all of the reasons why I stopped reading it the first two times. The dense language, the unnecessary information that does not move the story forward (nor is it, for me, interesting to read, like the dictionary definitions of dozens of different kinds of drugs I have never heard of). I am also remembering all of the reasons why I’ve kept it on my shelf for a different day, rather than getting rid of it like I have so many other books that I started and failed to read in their entirety. The large cast of quirky characters, the mysterious video, and, for whatever reason, the existence of the Enfield Tennis Academy, are luring me in despite the difficulty level of the prose. If any of you plan to read this epic adventure, take a look at some advice on how to read it. Have you ever read Infinite Jest? Is it worth plugging along to the end? Or have there been other novels that you tried and failed to read multiple times, but you’re not ready to give up on yet? I've never read it but I know you can! I doubt I would survive an attempt but I did enjoy the essay on how to read it. All quite intriguing and as a writer I am thinking I might learn something from all the emphasis on trusting the author. Wallace certainly intrigues me. And apparently it all works eventually. I don't know Anne, I still probably won't read it. And thanks to whoever posted that link - great site!